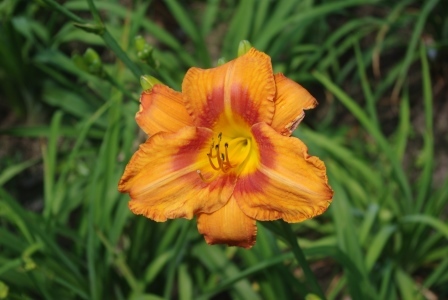 Since 1988 Telmarc has been growing and hybridizing daylilies. The following is a list of our introductions. 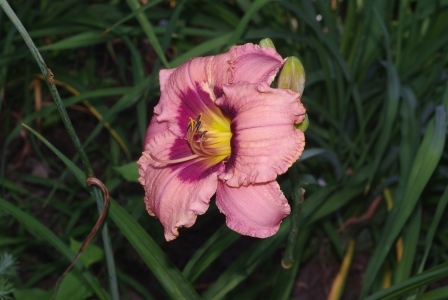 They are registered with the American Hemerocallis Society as named hybrids. 1. Species Infusion: We have used species plants to reintroduce species characteristics into hybridized plants. We believe that several species have characteristics which when brought in to a well developed hybrid will rejuvenate the line. 2. Eyezone: We enjoy the development of Eyezone plants. They have a certain dignity and difference which makes them attractive in any garden. 3. Spiders: Over the past few years we have also been working with spiders. On of our introductions for 2006 is a spider with an Eyezone. 4. Lilacs: We enjoy the softness of the lilac daylily and have been working on getting a good collection of these plants. They look almost like an iris in color and texture. I have an interest in pastels and some whites. Also fragrance is important and thus I use a lot of H citrina mixes. Enjoy our introductions. Here are some of the most recent ones from 2015. This is an amazing plat, well over 4 feet tall, 7"+ flower, many branches and buds per branch. It stands erect. A gentle pastel plant which I am prone to seeking out with good branching and buds. Strong dark pink with deep red Eyezone and gold throat. A double or even more. Pinkish with a bit of cream color. It seems to keep its double form.